VATICAN CITY (CNS) — Every day, countless visitors to the tomb of Blessed John Paul II in St. Peter’s Basilica leave letters and notes addressed to him. “Some were obviously prepared with care the evening before and written on formal stationery with an old-fashioned fountain pen,” said Elisabetta Lo Iacono at a news conference April 22 at the Pontifical University of the Holy Cross. Other letters, she said, are improvised, scratched even with an eyebrow pencil on scraps of paper such as a coffee bar receipt. 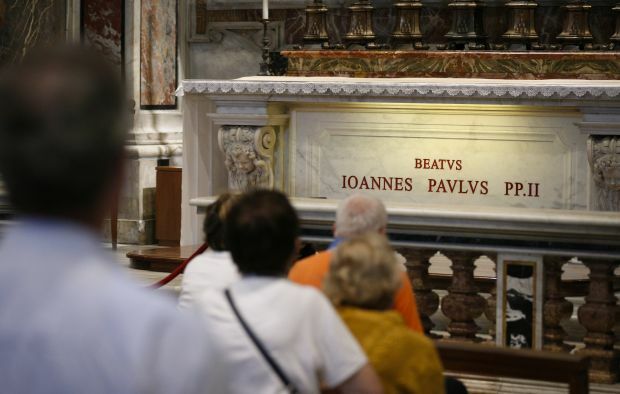 After Blessed John Paul was interred — first in the grotto of the basilica and later in a side chapel — Vatican employees collected the letters and notes left on his tomb every night. Lo Iacono, who teaches mass media at the Pontifical Theological Faculty of St. Bonaventure in Rome, was given access to the letters by Cardinal Angelo Comastri, the archpriest of St. Peter’s Basilica. He allowed her not only to study the letters, but also to spend long hours by the pontiff’s tomb to analyze people’s reactions and emotions. In drawings from children, the late pope was seen as “the grandfather who would be a companion for games and adventures,” she said. In some of the images, the late pope was depicted in the midst of a field of flowers, or surrounded by hearts with doves flying into the distance, she added. Letters from adults expressed pain and joy, contained confessions or prayers for the health of a loved one. “Often couples sought help in having a baby,” Lo Iacono said. Lo Iacono published a collection of the letters in Italian a book titled, “Caro Signor Papa” (“Dear Mr. Pope”) in 2010. One anonymous letter was written only two hours after the pope’s death on April 2, 2005. “Finally your agony is at an end, even though in our hearts we hoped for a miracle and wanted, with all our soul, to see you once again at the window. I was there on Oct. 31, with so much emotion: you spoke with a weak voice to the hundreds of people in the piazza, but for me it was as if you spoke only with me,” the letter said. Soon after his death and before his interment, people began leaving notes to the deceased pope at an impromptu shrine in St. Peter’s Square. Pilgrims piled notes, flowers, drawings and rosaries around a lamppost in the square and later by the obelisk in the center of the square. After his beatification May 1, 2011, the future saint’s casket was moved from the grottos to its current resting place in the Chapel of St. Sebastian inside the basilica.